The case of the death of Saudi Journalist Jamal Khashoggi, has widened greatly amid indications that this issue will harm the kingdom politically and economically, especially after the that US Secretary of State Mike Pompeo said to King Salman and the Crown Prince, MBS, that this issue may affect their future in governance. Regardless of the outcome of the investigation that Saudi Arabia has announced recently, which claims that Jamal was killed during a fistfight in the consulate at Istanbul, the one who will always be blamed for Kashoggi’s death is the Crown Prince Mohammed bin Salman (MBS) the actual ruler of the Kingdom. This issue of the killing of the journalist Khashoggi, came at a time when Saudi Arabia did not want to drain into another sump, coinciding with its war on Yemen, where it has failed militarily, politically and in the humanitarian aspect, in addition in suffering economically and instability of the new regime, which changed the mechanism to reach the throne. Before the disappearance of Khashoggi, MBS was preparing for an international investment conference (the Future of Investment Conference), the largest of its kind the Kingdom had planned to organize, to encourage foreign investors to return to invest in the Kingdom, especially after it had lost 90% of foreign investment, according to Forbes. Since Khashoggi’s disappearance on January 2, the investment conference was subjected to fatal blows due to the boycotting of finance ministers, businessmen and major international companies, as well as international agencies and newspapers that had signed partnerships to organize and attend the investment conference. The most serious obstacle that Riyadh was betting on not to happen to save the conference, was the announcement by the US Secretary of Treasury in consultation with President Trump and the Foreign Minister to not participate in this conference. The American decision has coincided with the CNN publish of that the US Secretary of State during his visit to Riyadh told Mohammed bin Salman that his future as “the next king of the kingdom” in danger. 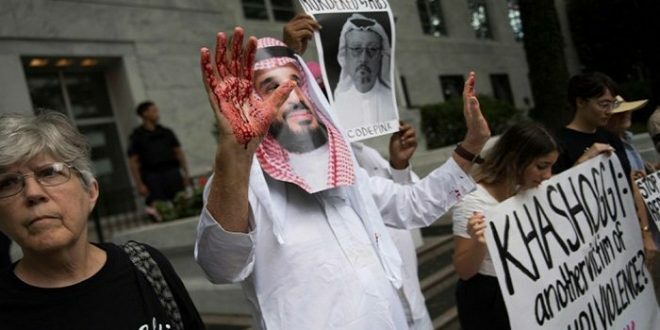 With the emergence of new evidence, including Maher Abdulaziz Mutreb, one of the closest figures of the Crown Prince, who accompanied the prince in his most recent recent worldwide visits, held responsible of the killing of journalist Khashoggi, which resulted in the of international boycott of the Saudi Investment Conference or what was called “Davos in the Desert”. According to the British Broadcasting Corporation, the US secretary of Treasury, Steven Mnuchin joined the list of high-level figures and organizations that decided to boycott an important investment conference in Saudi Arabia, following the journalist Jamal Khashoggi disappeared. In a tweet on his Twitter, Mnuchin said he had decided to drop out from the conference after meeting with US President Donald Trump and Foreign Minister Mike Pompeo. British Foreign Trade Minister Liam Fox and French and Dutch finance ministers announced their withdrawal from the Saudi conference, followed by a similar announcement by International Monetary Fund (IMF) Director Christine Lagarde. Earlier, World Bank President Jim Yong Kim also withdrew due to Khashoggi’s disappearance. Former US Energy Secretary Ernest Moniz has announced his resignation as the adviser to Saudi Arabia’s Crown Prince NEOM “Vision 2030” to diversify the kingdom’s economy which was then halted after the kingdom decided to cancel the bourse of Aramco oil company, which MBS was looking for to get Trillion Dollars to fund his vision. In the past few days, dozens of international figures and companies have withdrawn from the Saudi Investment Conference. In a preset time, the CEO of French military electronics company Thales announced the withdrawal from the Saudi Investment Conference. CNN, CNBC, the Bloomberg agency and newspapers such as The Financial Times and The Economist were among dozens of channels, agencies, and international newspapers that announced their withdrawal from the media partnership of the Saudi Investment Conference. This boycott reflected immediately on the value of the Saudi riyal and caused a severe blow to the Saudi stock exchange, which lost within just 24 hours, more than 50 billion dollars. However, the repercussions of the situation in the Kingdom will affect Saudi Arabia in the future because of the deepening fears of the owners of capital in the world from investing in Saudi Arabia under the recent suffering of a deep economic crisis for the past three years due to the decline in oil prices globally and the high cost of its war on Yemen, which according to the report of the institution “Brookings”, Saudi Arabia spends between 5 to 6 billion dollars a month in its war on Yemen.